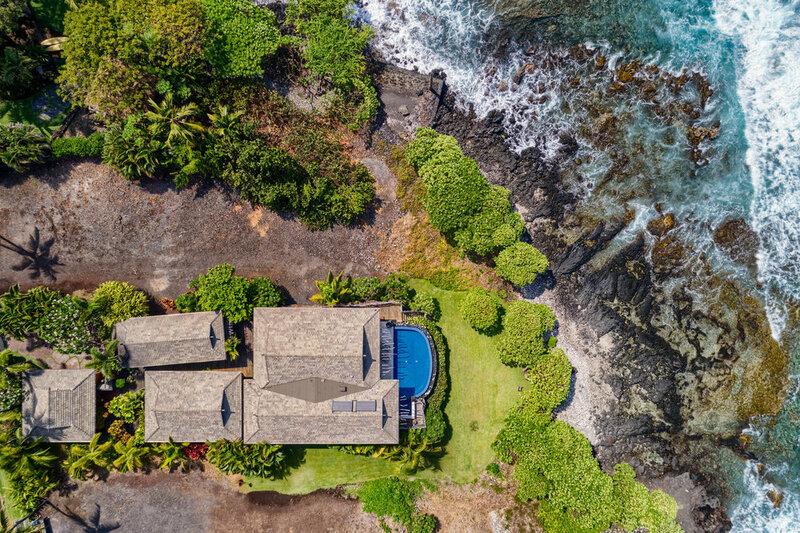 Hawaii Life Real Estate Brokers and Concierge Auctions are proud to present the auctions of two exquisite oceanfront properties — one custom home (Hale Ohia Kai) and one custom home lot — in Kailua-Kona’s exclusive Ke Alohi Kai Place, a gated, oceanfront luxury residential community. These properties are selling without reserve, separately or collectively, to the highest bidder(s) on January 31st. Enjoy sea breezes, ocean views and the best of Hawaii’s indoor-outdoor living at Hale Ohia Kai and/or build your dream estate on Lot 6. Enjoy the sunset poolside at oceanfront Hale Ohia Kai. Located adjacent to Holualoa Bay, a sanctuary for sea turtles and dolphins all year long and whales during the winter season, Hale Ohia Kai provides a private, tranquil retreat just three miles from the center of Kailua-Kona. Attractive Ohia wood is found inside and out. The estate offers the best of living in Hawaii with its oceanfront location, open floor plan and seamless transition between indoor and outdoor living spaces. Designed and built by the local firm of Ali‘i Architects in traditional tropical pod-style, the estate home’s name reflects the design team’s extensive use of Hawaii Island’s gorgeous native Ohia wood throughout, including exterior siding, trellises, and decks. The main residence is comprised of the great room, custom kitchen, and master suite, while the additional three ensuite bedrooms are housed in their own individual pods around a tropically landscaped central courtyard, providing privacy for you, your family members and in-house guests. 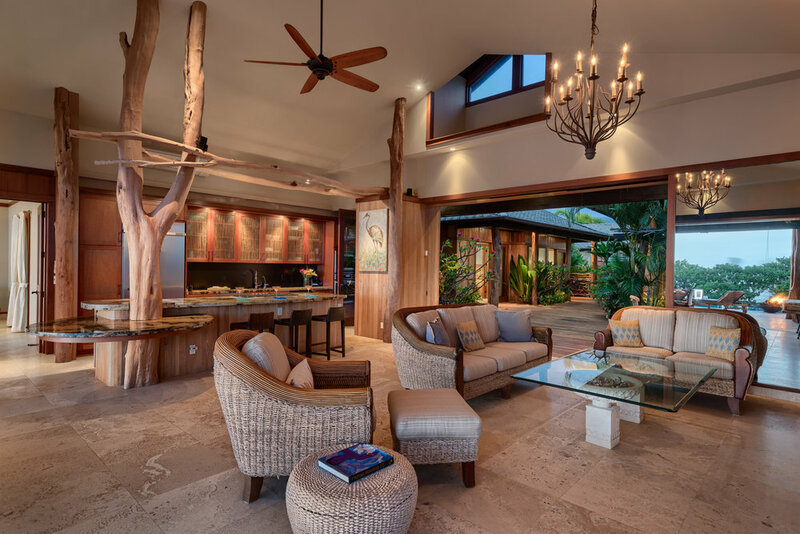 The great room with soaring ceilings and Ohia wood posts. Poolside outdoor living spaces with Ohia wood trellises. Among the home’s many additional unique features are 19-foot-high vaulted ceilings in the great room, sliding glass panel doors throughout, spacious lanai with elevated pool, hot tub and two fire features, and a two-car detached garage with tile flooring and ample storage space. Estate site #6, top of picture, is situated adjacent to Hale Ohia Kai. Ke Alohi Kai Place is comprised of 15 lots, including seven oceanfront estates sites. Lot number 6 is a premium oceanfront property with outstanding white water, ocean and coastline views. Premier Lot #6 at left, Hale Ohia Kai at right. For more information about the auction and these two properties or additional real estate opportunities, please contact Carrie Nicholson, R (B), BIC, Director of HL1-Big Island, (808) 896-9749, carrie@HL1.com or Randy Ripley, R(S), (808) 209-6244, Randy@HL1.com.